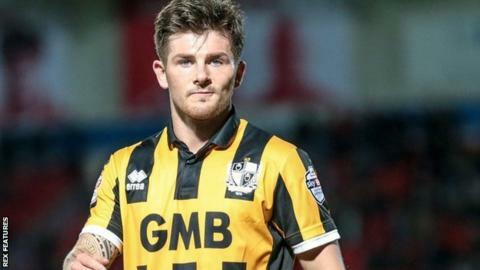 Winger Matthew Kennedy says he hopes his parent club Cardiff City will agree to extend his loan at Port Vale, ideally until the end of the season. Kennedy, 21, joined the League One side on a month-long deal in January and is already looking to stay beyond that. "I've settled in quickly, and I'm playing better and better," the Scot told BBC Radio Stoke. "The manager [Rob Page] is talking to Cardiff and I'd like to stay - even if it's just for another month." Kennedy has made five appearances for promotion-chasing Vale and the former Everton youth player is grateful for the action he is getting after waiting until November to play the first of two games for the Bluebirds before moving to the Potteries. "Obviously the more games you play, the fitter you get and the better you play," he said. "The manager's been brilliant with me and we'll see how it goes but if the deal can be extended until the end of the season that would be perfect." Vale, still up for sale, are ninth in League One, five points off the play-off places.